Imagine no longer being able to do your job because someone else who was not trained came into your place of work and ruined it for everyone else in your position. A 4Paws service dog sitting for its trainer. For countless service animals out there, this is very much the case. In recent years, the number of people, particularly college students, applying for and receiving permits to own emotional support animals has increased. This can be for many reasons. Some people definitely benefit from the kind of emotional support an animal companion can provide and receive a medical diagnosis to verify that benefit. Unfortunately for those with a legitimate need, the problem lies in how easy it can be to obtain a permit to make any dog an emotional support animal. Many places don’t require proof of a diagnosis which recommends an ESA. You can get a certificate that says your pet is a certified ESA on the internet for $80. Having these untrained animals in places they should not be can not only hurt the effectiveness of a trained animal, but they could also lash out and attack. “Our kids that have their dogs…they have reported that these two dogs, who are wearing these vests as therapy dogs, have lunged at them, growled at them, barked at them,” Kelly Camm, Director of Development at 4Paws for Ability said. 4Paws is a non-profit organization, based in Xenia, Ohio, that places fully trained service dogs with children in need. The dogs are trained for a multitude of purposes, ranging from assisting the deaf and blind, to helping children that suffer from seizures. 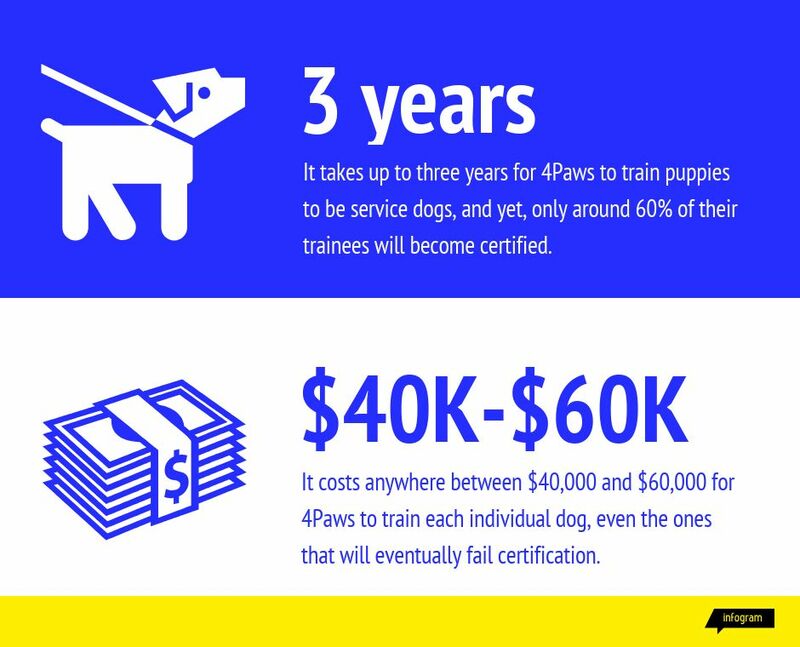 According to Camm, training each dog takes up to three years and costs 4Paws between $40,000-60,000. 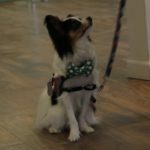 For some of those dogs, the first year is spent in Athens under the care of students involved in the Ohio University chapter of 4Paws. The OU chapter is critical to figuring out which dogs are cut out for service work and which are not. The “foster parents” keep copious notes, according to Camm, about the nature of the dogs in an effort to pinpoint the quirks and fears that may keep a dog from being advanced in service training. However, all of that training and time can be thrown out in an instant. Ohio University has tightened its restrictions in recent years on service and emotional support animals in response to the growing trend of students attempting to get their pets into dorms by claiming them as emotional support animals. A student needing an ESA must provide documentation from a healthcare practitioner, but Carey Busch, the Assistant Dean of Accessibility at Ohio, believes that the checks in place can prevent those with no need from getting through their system. And for those with that real diagnosis, emotional support animals can make all the difference. In some cases, an emotional support pet is exactly what a person needs to get through their day-to-day life, particularly when the person suffers with emotional disabilities such as depression or anxiety. One such animal is Eva, a chihuahua/dachshund mix that lives with Ohio University freshman Maisie Fitzmaurice in her dorm on South Green. Fitzmaurice was diagnosed with both depression and anxiety five years ago, one of nearly 75 million American children affected. She has suffered from panic attacks in the past and notices that Eva will come over to comfort her when the dog feels that she is getting too anxious. However, Fitzmaurice only has access to Eva’s comfort in the confines of her dorm room, or outside. 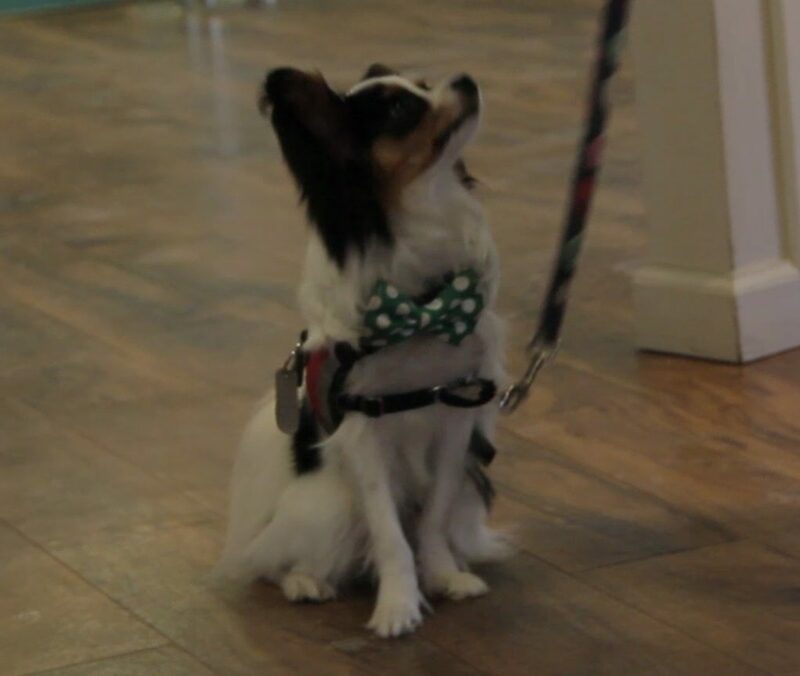 Eva is not allowed into classroom buildings, dining halls or even the lobbies of dorms due to issues the university has had in the past with emotional support animals. For people, such as Fitzmaurice, an emotional support animal is a crucial part of maintaining good mental and emotional health. But organizations such as 4-Paws believe that ESAs must be given a more defined set of regulations as to who can have them and where they can take them. The animals that are trained for service need those spaces to do their job.